The FIFA/OFC Coach Educators’ Course got underway at Pearl Beach Resort Hotel in Tahiti this morning with a full-house of enthusiastic participants eager to bolster their knowledge. The course brings together participants representing a near-full roster of OFC Member Associations for a week of learning led by FIFA Head of Coaching and Player Development Department Branimir Ujevic and Senior Manager Mohamed Basir, alongside FIFA Instructor and OFC Head of Coach Education Giovani Fernandes. OFC Chief of Football Patrick Jacquemet shared his excitement at the prospect of once again coming together with the key eductors in the region to enhance the capacity building which began in 2018. “We did the first course last year, 10 months ago in Auckland, and now we’re bringing back the same participants to make sure that at the end of the week they will be assessed and accredited as OFC and MA Instructors, in order for them to run all the Coaching Education programmes in their own Member Associations,” Jacquemet said. 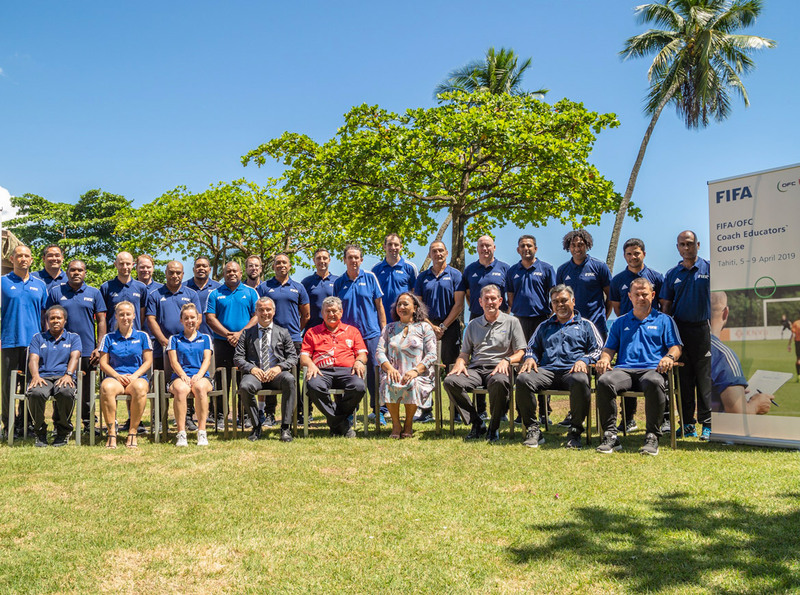 “We are now starting a new OFC Strategic Plan, with a new vision to be more competitive on the world stage and ready for 2016 when Oceania will have one-and-a-half spots available at the FIFA World Cup. The optimism about the future of football in the region was shared by Federation Tahitienne de Football President and OFC Vice President Thierry Ariiotima, who said the development of all forms of football is a priority for OFC and its Member Associations. “The new governors of OFC, freshly elected in February 2019, want to reorient the development of our football towards a new plan which takes into account the particularities of the countries which make up Oceania,” Ariiotima shared with the participants in his opening address. “We need to grow every country in terms of their football, without forgetting education, and in order to do that we need to teach them, to give them the opportunities and also share our experiences. “FIFA, OFC and the Federation Française de Football, for the French nations, gives us the financial, human, pedagogical and logistical means to develop football,” he continued. On behalf of FIFA, Ujevic shared his delight at once again finding himself surrounded by his Oceania colleagues. “It is a big pleasure to see you all here in Tahiti,” he said. “OFC is putting a lot of effort into coach education and we as FIFA are happy to give them support, to always be available for their needs. “But we also don’t want to keep the Confederation centralised, that’s why we’ve come here to Tahiti, French Polynesia, to continue growing your education and also enhance your experience of the next five days,” Ujevic concluded. The FIFA/OFC Coach Educators’ Course will cover topics ranging from the OFC Football Development Strategy 2026 and Member Association situation analysis to the teaching, learning and feedback processes. Participants will alter between theoretical and practical sessions and will also have the opportunity to take in a local Ligue 1 match, the OFC Champions League Quarter Final and the opening ceremony and action from the Festival des Iles, a week-long event which brings together 2000 football, futsal and beach soccer players from across French Polynesia.